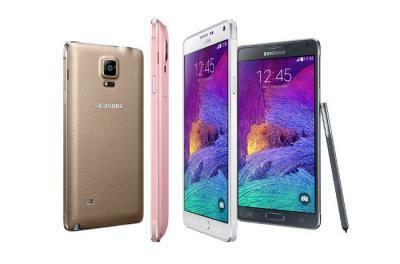 Samsung Note 4 is an Android 4.4 (KitKat) Smartphone (phablet?) that sports a large 5.7" QHD (2560 x 1440) Super AMOLED display. Other major features include a 2.7 Ghz Quad-Core CPU (1.9 Ghz Octa-Core in some markets), 3 GB of RAM, 16 mp camera (with Smart OiS), S-Pen, Heart-rate sensor, UV sensor, finger scanner, 32 GB of onboard memory (plus a micro SD slot) and a 3,220 mAh battery. The Note 4 features a premium metal (aluminum) frame. Besides the regular Note 4 phone, Samsung also announced the Note 4 Edge which sports an OLED display that curves around the right edge. The Galaxy Note 4 will be released in October 2014, globally.